A Worthy Contender - Pebble Smartwatch Review - Smartwatch This! What started out as a Kickstarter campaign for a new smartwatch went on to be come the most successful Kickstarter campaign to date, raising over $10.3 million, and has now become perhaps the most popular wearable tech item of 2014. 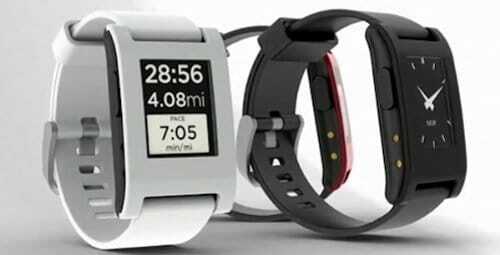 Meet the Pebble smartwatch. The Pebble smartwatch launched out of the gate with the crowdfunders waiting to spring in on the action, and it seems to have paid off. Best Buy sold completely out of the watch within 5 days, and as of March of 2014, it has sold over 400,000 units – not too shabby. Of course, with popularity also comes criticism, and while the Pebble smartwatch isn’t for everyone, some complaints do have merit. In this Pebble smartwatch review, we’ll lay out the pros and cons to provide some tools for the smartwatch buyer to make an informed decision on their smartwatch purchase. MULTIPLE COLORS AVAILABLE: Let’s face it – appearances matter. We buy decorative cases for our smartphones that reflect our personalities. Even as we scramble to get the next cool gadget because everyone else is buying it, we still want to be individuals, and the Pebble’s assortment of fun colors allows us to do that. Are you an artist or a bold person? Perhaps red might suit your style. Got a sunny personality? Maybe orange is better for you. Are you a fan of the simple, classic style? Go with black. At the time of this writing, you can get the standard Pebble in Jet Black, Cherry Red, Arctic White, Grey and Orange, or the Pebble Steel, a premium version made from brushed stainless steel. Pebble has also just introduced their #freshhotfly special edition colors which come in Fresh Green, Fly Blue and Hot Pink. REPLACEABLE BAND: Just as you have a choice in the color of your Pebble smartwatch, the replaceable band gives you further customization for your wearable tech device. CHOICE IN WATCH FACE: Pebble includes a few digital watch faces that you can switch between, and you can download more, or even create your own. USE WITH iPHONE OR ANDROID: Several smartwatches on the market today are compatible with smartphones using either the iOS or Android platform, but Pebble is compatible with both platforms, making it more versatile. Just because you change your phone doesn’t mean you have to change your watch. LONG BATTERY LIFE: Pebble claims its watch batteries last 5-7 days before needing a charge. Some users claim this isn’t the case, but a great deal of users claim that it does get good battery life. WEAR WHILE SHOWERING OR SWIMMING: The Pebble is water resistent up to 5ATM, which means that it can safely be worn while showering or swimming in shallow water. Note that the ATM does not indicate depth, but atmospheres, which is related to water pressure, not depth. 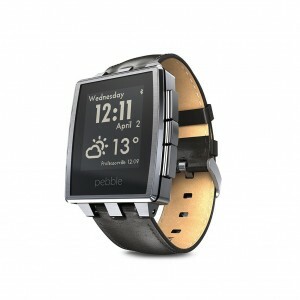 APP SELECTION: There is a huge selection of downloadable Pebble apps for your watch. Get apps for fitness, sports, music and games. BACKLIGHT: If you need to see your Pebble in the dark, just give a flick of your wrist and the backlight comes on without having to push any buttons. DAYLIGHT READING: The Pebble uses an e-paper display (similar to the Kindle) which allows for easy visibility, even in direct sunlight. INCONSISTENT BATTERY LIFE: When researching for this article, the main complaint I found was related to battery life. Some say that it doesn’t last the 5-7 days claimed by Pebble, with some users stating that they have to recharge completely each day. INCONSISTENT BLUETOOTH CONNECTION: Another complaint is that the bluetooth connectivity between their watch and their smartphone is inconsistent, and periodically breaks the connection, requiring that it be re-paired with your phone, which is a hassle. NO COLOR ON SCREEN: While the color displays seen on some smartwatches are nice looking, it also drives up the cost. The Pebble keeps it simple with a colorless screen – while others may not find the screen as attractive, I’m not sure I’d call it a con but I’m listing it here as such, since some people aren’t fans of the screen. CHEAP LOOKING ARMBAND: Again, a matter of taste, and the Pebble isn’t for everyone. Some like the fun, plastic-y armbands, some don’t. The armband is interchangeable, however, so while the bands that come standard with the Pebble may not be to your liking, you can get bands from other companies made from different materials or in different colors that might solve this problem. CUSTOMER SUPPORT LACKING: I can’t vouch for this myself, but one complaint I’ve seen had to do with the response (or sometimes lack of) from customer support. While I don’t doubt that some of these complaints are legitimate, as someone who worked for years in tech and customer support, I also know that you just can’t please everyone. I’m going to give Pebble the benefit of the doubt here because most people seem to be satisfied with the watch and it’s support team. I will say that given the popularity of the product, Pebble should make every effort to establish a top notch support team because if you have amazing support, people may gravitate toward your brand based on that alone. LIMITED APP SLOTS: The Pebble comes with only 8 app slots, limiting the number of apps you can download. However, it’s worth keeping in mind that this is a watch – not a full-on smartphone. INCLUDED FACES CAN’T BE REMOVED: Some people wish they could delete the 3 faces that come with the Pebble. Unfortunately at this time, you can’t delete the ones that come standard with the smartwatch. APP UPDATES: Apparently if an app that you have installed needs updating, you are not able to update through your Pebble. You have to delete the app, then re-download the latest version, which is something they should definitely consider fixing in a future update. So there you have it. While this likely doesn’t cover all the pros or cons of the Pebble smartwatch, it ought to give you a good idea of the reasons people love it or why some don’t. All in all, I think that for the price (Pebble comes in at an affordable $150), Pebble has quite a bit to offer, and would definitely be worth consideration.